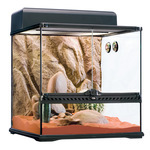 Thanks to Exo Terra's natural approach, the terrarium hobby has evolved tremendously over the past few years. We turned a reptile “cage” into a “terrarium”! All Exo Terra products and components have been designed to work together, helping you to create and establish a harmonized natural-looking microhabitat. By combining the right products, Exo Terra makes it possible to cater to almost any species from almost any specialized habitat. We here at Aquarium Spare Parts endeavour to keep all genuine Exo Terra products in stock. However if there is a product you are looking for but have not seen on our website please contact us at findmypart@aquariumspareparts.com.au and we will do our best to source it for you.